Britain's ability to respond to military threats from Russia will be "eroded" without further investment, the head of the Army has said. Russian hostility could come sooner than expected and Britain must prepare to "fight the war we might have to fight", General Sir Nick Carter added. The speech - approved by Defence Secretary Gavin Williamson - comes amid speculation of potential defence cuts. The warning comes after Russia has practised simulated attacks in Europe. In the speech, at the Royal United Services Institute, Gen Carter highlighted Russia's new cyber warfare capabilities. He also spoke about Russian long-range missile strike capability, which he said was demonstrated in Syria when 26 missiles were deployed from a 1,500km (930 mile) range. Gen Carter said Russia was building an increasingly aggressive expeditionary force and the potential military threats to the UK "are now on Europe's doorstep". He said the Kremlin already boasted an "eye-watering quantity of capability" - a level the UK would struggle to match. Gen Carter stressed that Britain "must take notice of what is going on around us" or that the ability by the UK to take action will be "massively constrained". "Rather like a chronic contagious disease, it will creep up on us, and our ability to act will be markedly constrained - and we'll be the losers of this competition," he said. He said he did "not in any way" want to suggest that Russia would go to war in the traditional sense, but that Moscow "could initiate hostilities sooner than we expect". "I don't think it will start with little green men, it will start with something we don't expect. We should not take what we have seen so far as a template for the future.". Zapad: What can we learn from Russia's latest military exercise? 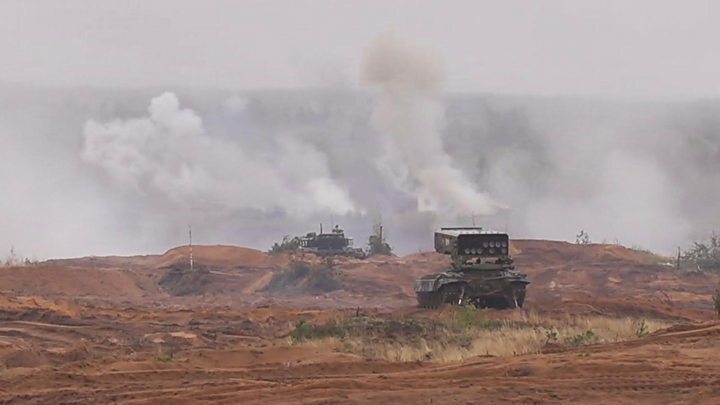 It comes as the Russian army conducted large scale military exercises last year on home soil, in Belarus and in the Russian territory of Kaliningrad - which is sandwiched between Nato members Poland and Lithuania. It was one of Russia's biggest military exercises since its 2014 annexation of Ukraine's Crimea peninsula. Prime Minister Theresa May's spokesman said the UK's £36bn annual defence budget meant the government was addressing the range of threats from "a position of strength". However, Labour shadow defence secretary Nia Griffith said she was sure Gen Carter would have tried to make his case behind closed doors but had gone public as a "last resort". She added that if voicing concerns over funding made the prime minister and the chancellor "wake up", it would have been worth "making the fuss". Admiral Lord West, former head of the Royal Navy, said such warnings from a serving chief were unprecedented. "For them to talk about the need for more resources, I haven't known that in my 52 years in the navy - I mean this is extraordinary," he said. The reality is that Britain would never confront a threat like Russia on its own. That's why it is part of Nato. But even as a key member of the alliance, the truth is that some of the UK's weapons are increasingly outdated. While Russia's been developing new Armata tanks, the Army's Challenger 2 hasn't been modernised for 20 years. Many have been mothballed as the UK focused on the counter-insurgency campaign in Iraq and Afghanistan. Britain's ground-based air defence systems are also becoming increasingly obsolete and no match for Russia. Still, the likelihood of any direct military confrontation with Russia seems extremely remote. True, the US National Defence Strategy recently highlighted the risks of a more assertive Russia and China. But for now, the concern is more about those countries using cyber and misinformation to disrupt life in the West. General Carter's intervention is more driven by fears of further deep cuts to the UK's armed forces. The Ministry of Defence has a black hole in its budget. It is rare for a military chief to make such an obvious and public appeal for more cash. But he's doing it under the orders of the Defence Secretary Gavin Williamson. He has sent his generals over the top to put pressure on the chancellor. Robert Hannigan, who stood down as director of the intelligence monitoring service GCHQ last year, said Russia was the single country that had "kept me awake" in recent years. He told BBC Radio 5 live: "They have always been very capable, but in the last two, three, four years they've become quite aggressive." Gen Carter's speech comes as national security adviser Mark Sedwill conducts a review of the UK's security capabilities. All three armed forces have been asked to put forward options for cuts as the Ministry of Defence looks at how it will control spending. There are concerns within the forces that the review will prioritise counter-cyber attacks and terrorism, rather than major defence. 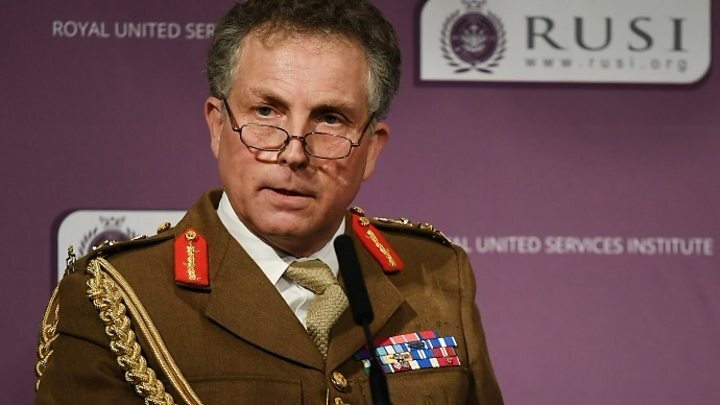 Col Rupert Wieloch, a former senior British commander of forces in Libya, said the structure of funding needed to be addressed so that money for the armed forces was not "confused" with money for cyber security. However, Britain's armed forces are now at their smallest since the Napoleonic wars. The size of the Army has been cut from more than 100,000 to 82,000 since 2010. Last week Conservative MP Julian Lewis, chairman of the Commons defence select committee, posed an urgent question in the Commons after speculation that there were plans to cut the UK military by 14,000 service personnel, nine warships and 100 helicopters. Mr Williamson said "hard work" is taking place to give the armed forces the "right resources". Some MPs have called to increase defence spending to 3% of GDP. It is currently at 2% - in line with guidelines for Nato members.